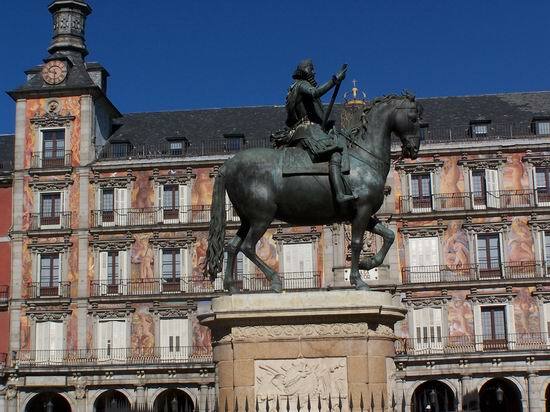 The present building of the Casa de la Panadería stands at number 27 on the north side of Madrid's Plaza Mayor, just behind the central statue of Felipe III. The original building was a wooden construction designed by Juan Gomez de Mora and completed in 1619. It was destroyed by fire in 1670 and was rebuilt by Thomas Roman. Claudio Coello and Jose Jimenez Donoso were responsible for the façade frescoes and interior decoration. In 1790 there was another fire in the plaza. Juan de Villanueva was then responsible for the reconstruction of the building. Today's structure is mainly that design, but it has undergone several refurbishments since, notably in 1880 under the direction of Joaquin Maria de la Vega. In 1914 Enrique Guijo was commissioned to do decorative paintings on the façade. By 1988 the decoration had deteriorated so much that the Madrid City Council held a competition to find an artist to restore the façade. A number of artists were invited to compete including Sigfrido Begué Martin, Carlos Franco and Guillermo Pérez Villalta. Carlos Franco was chosen for the task and the work was completed in 1992. The Plaza Mayor was originally a large marketplace that the Moorish Arabs set up just outside the old city walls of Madrid. It stood on an old dry lake bed. Following the Reconquista, when the Moors were finally expelled from the Iberian peninsula, Phillip II ordered the old meandering marketplace to be replaced by a new, properly designed arcaded plaza. He envisaged a grand design where merchants could feel their importance and where business could be conducted properly. Casa de la Panadería, or the Bakery, was designed to house the Bakers' Guild. This organisation held a lot of power, being able to control the price of grain. This gave them great political and economic power, influence and importance. The building has two Flemish style towers and spires, and stands at the north end of the square. 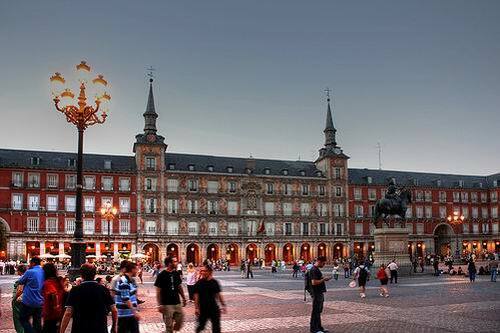 On the opposite side of the Plaza Mayor is a similar building that also has two towers and spires. This is the Casa de la Carnicería, once the butchers' shop. From 1732 Casa de la Panadería housed the offices of Peso Real y del Fiel Contraste, effectively the Royal Standard Weights and Measures offices. Between 1745 and 1774 the Real Academia de Bellas Artes de San Fernando had its headquarters there, and from 1774 to 1871 the Royal Academy of History was housed in the building. Madrid City Council took it over in the late 19th century, and later it also became the home of the Municipal Library and Municipal Archives. Casa de la Panadería is free to enter and is open every day from 11am to 2pm, and from 5pm to 8pm. The nearest Metro station is Sol, lines 1, 2 and 3, at Puerta del Sol, a short distance to the east in the city centre. Metro stations, Opera, lines 2 and 5 to the northwest, La Latina, line 5 to the south, and Tirso del Molina, line 1, to the southeast, are also within reasonable walking distance of the Plaza Mayor and Casa de la Panadería.